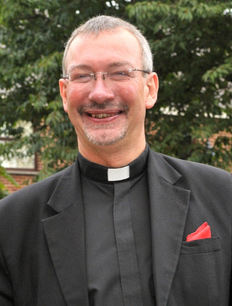 Stephen, or to give him his proper title, Revd Canon Dr Stephen Foster holds a degree in music and a doctorate in theology. Having been in the vocal care of John Chapman whilst at university in London, Stephen, a basso profundo sung both at the English National Opera as well as at the same time being a regular visitor to both stage and concert hall as a soloist in this country and abroad. Whilst reading for a second degree in theology and subsequently, within ministry Stephen has been able to maintain his semi-professional singing career, recently singing as near as Whissendine, Melton and Uppingham and as far away as Paris, Prague, and Japan. Recent major roles include Sarastro in the Magic Flute, Fiesco in Simon Boccanegra, and in a very part time post graduate year at the Royal Northern College of Music, Truelove in The Rakes Progress. He has a large number of performances booked in the next months both here and abroad, and soon he is to sing the part of The Commendatore in Don Giovanni. But, as he says, "Someone has to do it!!!"